Flagship Sign Designs opened for business in 2001. 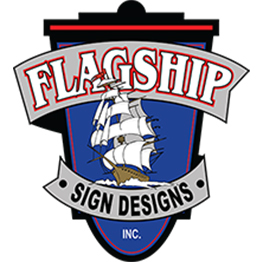 Based in Columbia, South Carolina, Flagship Sign's 25,000 square foot facility boasts an in-house art department, metal and wood fabrication, the ablility to mold plastic sign faces, and a state-of-the-art CNC router table for cutting intricate computer designs. Therefore we have the capabilities to pull panned, embossed acrylic faces. With the equipment and facilities we have, we are able to produce channel letters, monuments, sand blasted signs, pin-mount letters, and so on. We are an authorized UL company. And by being so, our signs are built to a certain quality standard. From start to finish, our capable and experienced staff can direct you in the proper choice of signage and ensure you are satisfied with your product. Meeting the Challenge for over 20 years! From start to finish, our capable and experienced staff can direct you in the proper choice of signage and ensure you are satisfied with your product. Copyright © 2018. All rights reserved. Web Design: Red Hair Media, LLC.